Pictured Left To Right: Mr. Luke Kelsey-Principal of Wendell Middle School, Students: Erika Nava, Bailey Pearson, Antonio Bettencourt, Andrew Vasquez, and Sharon Bettencourt, Owner of Bettencourt Dairies LLC. (Jerome, ID) –February 24, 2015 – Idaho Milk Products and Bettencourt Dairies have sponsored a nationally recognized program at a local school to increase awareness and help prevent bullying. The program, Rachel’s Challenge, was created to provide schools with the tools and resources to implement a positive learning environment in order to combat bullying. Bettencourt Dairies and Idaho Milk Products presented Wendell Middle School with a donation to support the program during the course of the school year. “Bullying hinders the learning process and putting a stop to bullying is a top priority at the Wendell Middle School. That’s why Principal Kelsey and the Wendell Middle School have embraced Rachel’s Challenge. Rachel’s Challenge is a great project that helps students understand the consequences of bullying and how it affects their fellow students, friends and even family. Even if Rachel’s Challenge only touches one student’s heart, as it did ours, we know it will have made a difference. We are glad to donate to such a successful program that will continue throughout the school year,” said Sharon Bettencourt, Owner of Bettencourt Dairies, LLC. Rachel’s Challenge will help Wendell Middle School create a positive climate to further enhance the learning environment at their school. 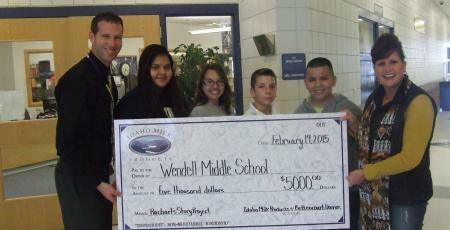 A club known as FOR (The Friends of Rachel), has been established at Wendell Middle School. This club consists of 7th and 8th grade students hosted by advisor Mrs. Smith and 5th and 6th grade students hosted by club advisor Mr. Kuka. In total, FOR consists of 35 students that meet once a week during lunch to plan activities and promote positivity. “Whereas most anti-bullying movements emphasize the need to stop negative behavior, the Rachel’s Challenge program, which has been presented to millions of people across the world, promotes acts of kindness, motivating students to create a positive climate in their school. Accordingly, staff and students alike pledged to accept Rachel’s Challenge, and after the whole-school assembly, several students were invited to train to be members of a special Friends of Rachel Club,” said Mr. Luke Kelsey, Principal of Wendell Middle School. Idaho Milk Products is a privately held international milk processing leader supplying Milk Protein Isolate, Milk Protein Concentrate, Milk Permeate and Milk Cream derivatives to global food and nutrition companies. Owned by three American dairies, Idaho Milk Products has the world’s most efficient farm-to-finished product operation resulting in the freshest and highest quality dairy ingredients available globally. Idaho Milk Products operates the largest dedicated, Grade A designated and SQF 2000 Level 3 certified, Milk Protein Concentrate and Milk Protein Isolate processing plant in the world, processing 40 million pounds (18,000 metric tons) of IdaPro® Milk Proteins per year. More information can be found on the company’s website at www.idahomilkproducts.com. Bettencourt Dairies, a locally owned and operated dairy farm has been in business for over 30 years. Bettencourt Dairies main milking operation is located in Wendell, Idaho. With 6 milking facilities in the Magic Valley, Bettencourt Dairies has 240 employees-including family, partners and staff. Rachel’s Challenge is a national non-profit organization dedicated to creating safe, connected school environments where learning and teaching are maximized. Based on the life and writing of Rachel Scott, the first victim of the Columbine tragedy in 1999, Rachel’s Challenge provides a continual improvement process for schools designed to awaken the learner in every child. We motivate and equip students to start and sustain a chain reaction of kindness and compassion that transforms schools and communities.